Quite a lot of people have asked how I am doing with my pregnancy – and I’m thankful for everyone checking in on me! So I decided to give everyone a little update on my progress. Thoughts: I cannot believe I am over halfway there – in a little less than 4 months our sweet baby girl will be in my arms. That is quite exciting, but also quite terrifying. I do wish time would slow down a little bit because I feel like we have so much to learn and do before she arrives, but I know God will have prepared us for all we need to know once she is here. Advice from friends and family with babies: Everyone is telling me to go on dates while it’s still just Tolar and me. And we have definitely followed that advice, in fact this weekend alone we went out on both Friday and Saturday night (Watch out world, a bunch of crazy kids are over here). Baby: She weighs a little over a pound and is almost a foot long, about the size of an ear of corn. Her brain is growing quickly and her taste buds are continuing to develop (I sure hope she likes bananas and peanut butter, I’ve eaten my fair share). The baby’s lungs are developing branches of the respiratory tree and her skin is still translucent, but that will all change soon. Her heartbeat continues to be strong, I love hearing the sound whenever we go to the doctor. 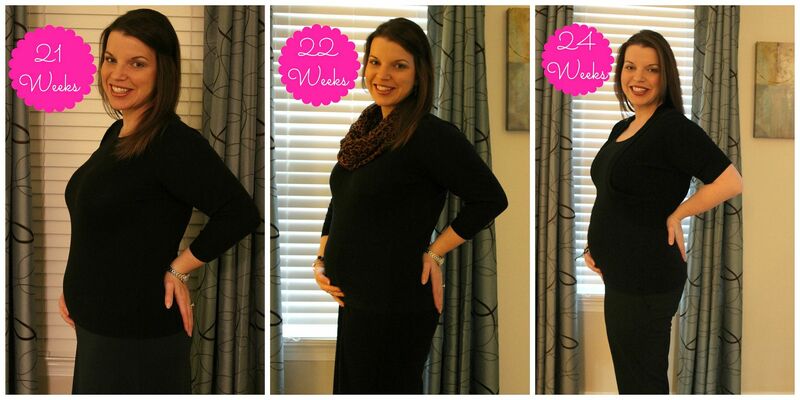 Movement: I have felt her kicking since I was 18 weeks, but the past two weeks she has been very active. Her kicks are getting stronger and I am hopeful that Tolar will be able to feel her move soon. I grab his hand whenever I feel a good kick, but so far he hasn’t been able to feel anything. Sleep: I’m not sleeping that well, I wake up at least three times each night. Unfortunately I am normally a back sleeper which isn’t a good position when you are pregnant. I try to turn from side to side, but it takes awhile to get comfortable. I did buy a Snoogle pillow (in pink of course!) and have tried it a few times; I will probably use it more as my belly gets larger. Food: Luckily I haven’t really had any aversions to food since I’ve been pregnant. 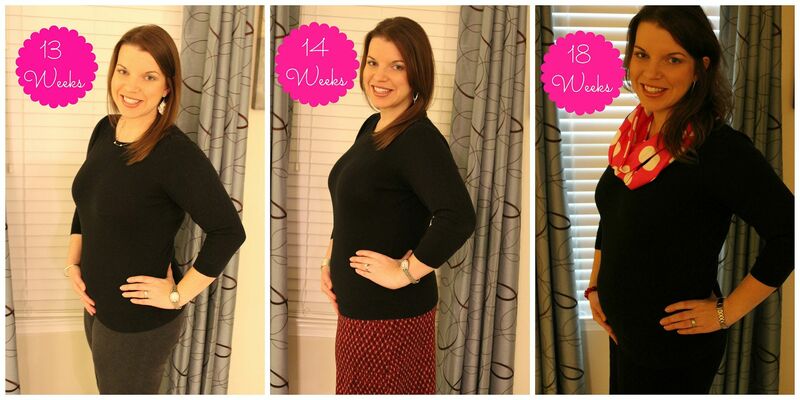 During my first trimester I did get a little nauseous whenever I smelled cooked chicken or ham, but that has passed (let’s get real – I was nauseous all day every day during my first trimester; I’m so happy to be finished with that stage). Grape tomatoes still continue to taste even better now that I am pregnant. I’ve always loved them but during my pregnancy the tomatoes taste amazing! Preparing for baby: We are searching for childcare now and are quite overwhelmed. Luckily, we have lots of friends and my expert sister to give us plenty of advice. The nursery is underway; I found some bedding that I love, we decided on a glider and now we just have to add some accessories and paint the chevron wall. We also registered – now that was an experience, I think we need everything! Prayer requests: I could definitely use your prayers for more sleep, because I recognize that once she gets here sleep will be quite the luxury. I also covet your prayers to lessen my fears during labor and delivery. I’m a pansy who DOES NOT handle pain well, like at all! So please if you think about it, pray for me to be calm and focus on the end result – my precious baby girl. Thanks everyone for following along and for your prayers and congratulations thus far! Your support really means so much to me! Oh gosh yes, date nights are no longer existing for Aaron and I. Emma will be 1 next week. I miss spending time just the two of us. you look wonderful girl!! Praying for more sleep and an easy time to find childcare for your little lady! You look AMAZING!!! Praying that you get some rest! Look at that bump! Such a beautiful mama you are. :) That made me sound like Yoda, haha.